Engineers are often called upon to make public presentations, whether speaking to a group of middle school students, explaining a project to the public, or presenting Garver's engineering expertise to a potential client. To help young engineers prepare for their time in the public eye, Garver's Tulsa, Oklahoma office has developed a public speaking training program. Since last May, seven employees with Engineer Intern licenses have chosen topics and given lunch seminars to coworkers. The engineers focus on developing a message and presenting the information in a clear manner. After each presentation, comment cards are handed out, and the audience provides feedback. 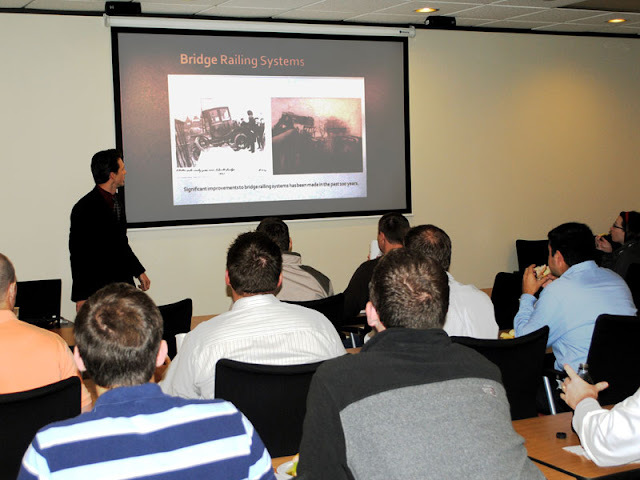 Bradley Banks' presentation focused on Bridge Railing Systems. Brad graduated from the University of Texas at San Antonio in 2010 and is a structural engineer in the Transportation Group. "The public speaking presentations allowed me to sharpen my communication skills in the presence of peers," Bradley said. "This training will be especially useful in technical presentations that highlight Garver's commitment to providing clients with valuable engineering expertise." Jeff Rundle graduated from Oklahoma State University in 2009 and is a structural engineer in the Transportation Group. He titled his presentation Accelerated Bridge Construction: SH-51 over Cottonwood Creek. "My presentation gave me more confidence in my public speaking skills," Jeff said. "These presentations help us as we become more involved in the project management aspects of our jobs." Other topics have included Technical Writing Dos and Don'ts; Asphalt Pavement Design; and ODOT Environmental Studies. Engineers involved in the program include Marc Flusche, Garrison Smith, Lacee Stanley, Andrew Snyder, and Nick Braddy.